Shannon came to us after being "dumped" at an apartment complex in North Dallas. She had spent over 30 days living and hiding in shrubs, patios and the parking lots. She was petrified when we first met her. She also weighed a staggering 36 pounds, had 50% hair loss, and obviously didn't feel well. We knew we had our work cut out for us. After visiting our vet several times, and getting the results of multiple tests, we found out Shannon had Cushing's Disease, a heart murmur, mange and massive skin infections. We continued to treat her and put her on a much needed diet. In time Shannon's coat began to shine in all its' glory. Her skin was healing, her coat was growing and the weight was beginning to come off. Shannon was on the mend! Then, out of nowhere, Shannon began having blood in her urine. Tests showed a tumor. It was bladder cancer, and deemed inoperable. We have been using tumor shrinking medications to allow Shannon relief from the discomfort. It has served her well for several months. 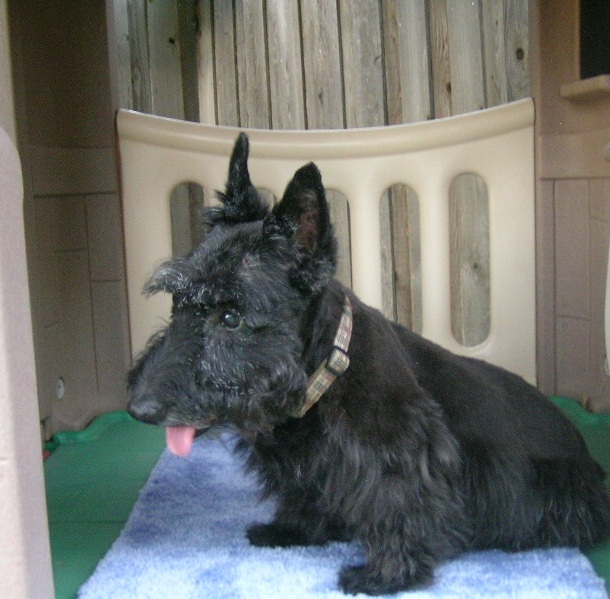 She has been able to run and play with some of her Scottie friends, and well, enjoy life for a change! But now, she has been dealt a final blow. She has been diagnosed with a brain tumor, and is having difficulty walking. Shannon is in the final hours of her life. Our hearts are broken with this news, as Shannon has become part of our rescue family since she has been with us for so long. What a wonderful girl she has been. Shannon has now entered our Hospice Care Program. Dogs like Shannon are with us because we care about the 'adoptable dogs', just as much as we care about the 'unadoptable' ones. These dogs have been in our care to get them the medical attention they so badly need. It gives them a chance that they otherwise may not have had. We can only continue to help dogs like Shannon with your help. If you are able to donate, please do. It means so much to all the dogs. All dogs adopted by Scottie Kingdom Rescue, Inc. have had a full medical exam by one of our licensed Veterinarians, which includes testing (and treatment, if necessary) for Heartworm disease, Lyme disease, Ehrlichia and Anaplasmosis, all necessary vaccinations, spay/neuter surgery, dental cleaning as necessary, microchipping, registration of the microchip, and any other medical needs each particular dog may need. Because we want to assure you of the health of our adoptable pets, we include a pre-paid 30 day health insurance policy with each adoption. Copies of all available medical records are transferred to you when the adoption is finalized. We prefer to adopt to families with past Scottie, Westie, Terrier (or similar) experience, but realize this isn’t always possible. We do not ship our pets. If you have that special place in your heart, and in your home, for a Scottie (or any of our other available rescue dogs), please visit us in Dallas for an in person meet & greet session with our available dogs. If you have existing dogs, they must travel to Dallas with you, so we can be assured that they will be compatible with the new addition to your family. Please contact us at Rescue@scottiekingdom.com to receive an Adoption Application or for more information on our Adoption process. Also, please take the time to visit our website www.scottiekingdom.com for additional information. Scottie Kingdom Rescue, Inc. is an I.R.S. approved 501(c)3 Non-Profit Organization. We are not supported by your tax dollars or public grants, rather, we rely on donations to help us continue our rescue work for animals that are in need. Your donation is tax deductible to the extent allowed by law.